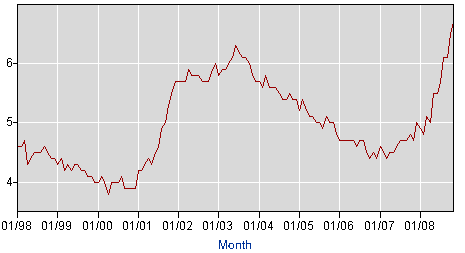 According to the latest report by the Bureau of Labor Statistics , the November 2008 unemployment rate was 6.7%. 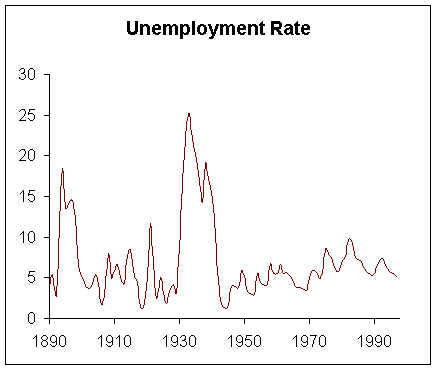 During the Great Depression’s second year (1930), unemployment rose from 3.2 to 8.7 percent. In 1931 unemployment rose to 15.9 percent. At its peak in 1933, unemployment got to around 25 percent, more than any other country besides Germany. 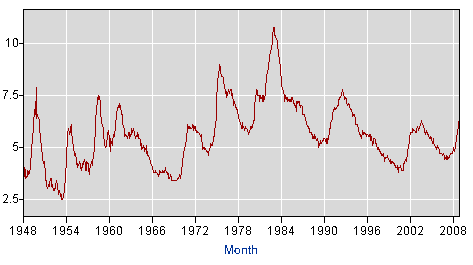 The chart below gives a rough representation of the aggregate unemployment rates in the US from 1890 to 1999. So, one can hardly say we are in a depression by looking at our current unemployment rate. If unemployment continues to rise, however, we cannot rule out the possibility of a depression happening. Below are charts taken from the Bureau of Labor Statistics that go up to 2008. The Organization of Petroleum Exporting Countries recently decided to cut production of oil in an effort to raise prices, says Bloomberg. 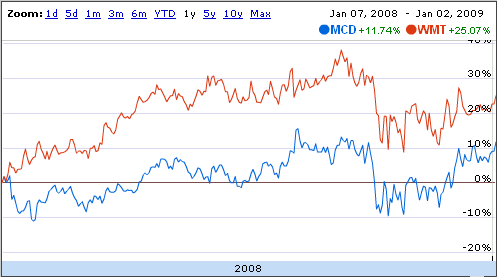 A funny thing about it is people are betting against the price of oil, in an ever worsening economy. The US Department of Energy predicts a .5% drop in demand next year, it seems the Recession of 08′ is finally doing some good (reducing fossil fuel consuption). The unfortunate thing about the oil drop is that it will probably cause a reduction in R&D on alternative energy. We as Americans need to wake up to what we are doing, and understand how the economy works and what our part is in it. Can we really expect the world to put up with the United States deficit? “Every American has an implicit mortgage of over 175,000 dollars each, each household, 400,000, but unlike a typical mortgage, there is no house to back this. Policy changes could prevent all of the previous predictions from occurring. Unfortunately, that will not occur, in due course, the Constitution will continue to be steadily undermined and the American Republic further weakened. We’ve already pumped in 700 billion dollars, we are going to pump in another 700 billion dollars, this is going to destroy the dollar. -Ron Paul after the Fannie Mae Freddie Mac, other bank buyouts and before the 700 billion bailout passage. David Costello, an advocate and builder of free homes for the homeless, recently realized the nightmare that is the Des Moines city council. The man is retired, and although short on cash himself has embarked on a mission to single-handedly fight homelessness in the Des Moines area. City Council has ruled the structures against fire code, and has promptly destroyed the homes built for free for those that have nothing else. They ruled that the huts that he had built, free of charge near the Des Moines River were to be torn down after an accident involving one of the homes burning and a man getting minor burns. 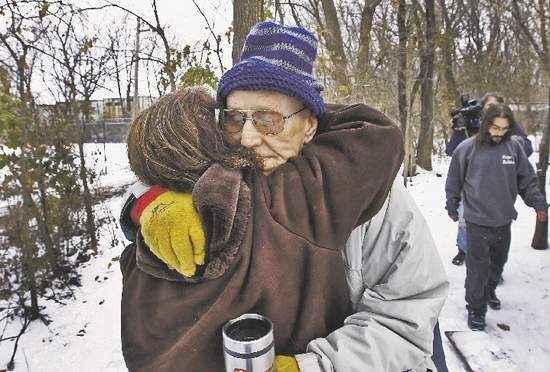 The homes were torn down on Thursday of last week, in the middle of an Iowa Winter. I don’t know about the people reading this blog, but winters in Iowa are very cold. The huts, which were constructed from pallets and scrap lumber had windows, manufactured doors, and wood-burning stoves. Anyone who has camped knows that tents are really cold, and don’t offer much protection against the elements. Regardless, the City Council declared the shanties fire hazards and decided to bulldoze them. My question is, why is the city council ruining everything that was done freely for the homeless? Must they waste money on bulldozers and putting these homeless up themselves when kindhearted people are doing it for free? Who is Responsible for our Financial Crisis? Who I ask is responsible for the financial crisis of 2008? (If you don’t feel like reading this post but have your own notions of who is responsible then please feel free to comment without reading the below). This is a very hard question to answer, and I for one certainly do not have a definitive answer. I can, however, provide some clues as to what put us in this situation. The average American consumer saved 10% of their annual income in the 1970s, now the average consumer saves 0%. The national debt is over $10,600,000,000,000! Going back to personal savings if Americans were able to save 10% of their income and avoid going into debt we would not be experiencing depression today. But going back to the root problem, if rates weren’t so low then people wouldn’t be so enticed to borrow so much. However if rates weren’t raised (which they were before the mortgage crisis) most likely most homeowners would be able to make their house payments. trying to get donors to pay back some of the 7.5 million dollars in debt. To add to the misery, the value of the dollar is appreciating, and credit is harder to come by. That means that the debt accrued is worth more now than when it was accrued, instead of the historically inflationary advantage that came with owing debt. My question is: what makes it legal or necessary to accrue debt in a presidential campaign? Shouldn’t they simply spend what they have, instead of spending more than the donors give them? This is another living example of the nature of the US government, “spend first, find out how to pay for it later”. No wonder the state of the union is so unpleasantly confused and complicated. General Motors has reached the lowest level in over 70 years, and earlier today touched $1.70 (that’s right, one dollar and seventy cents). After yesterday’s rejection of a large government aid package, GM will finally be allowed to die. There was a time when GM was the largest corporation in the US, and there was a time when GM was the single largest employer in the world. However shoddy products and expensive production costs, mixed with its union liabilities and benefits for generations of retirees has culminated into an unmanageable mess that cannot be fixed by any non-miraculous means.